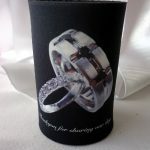 Black stubby cooler personalised on the front with a photo of the bride’s and groom’s wedding rings and ‘Thank you for sharing our day’ and on the reverse side are the bride’s and groom’s names and wedding date. Coolers are made from Neoprene (similar to wet suit fabric) and come with a solid base. Approximate size 10.5cm tall x 7cm in diameter. These coolers come in any colour and any graphic design can be printed. Please call our shop to discuss further.